Gill is the Law Centre's Housing Solicitor and our Senior Solicitor. Gill qualified in 2001 and during her employment has supervised the training contracts of five trainees who have successfully qualified as solicitors. 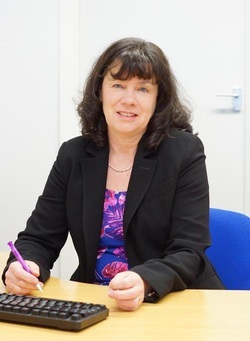 Gill is the Law Centre's Company Secretary and reports to our Board of Trustees on all matters relating to management and compliance with our statutory duties. Gill represents clients in housing related proceedings in the local county court and at Manchester Civil Justice Centre, including defending claims to possession, injunction and committal proceedings and Orders for Sale of property. Gill also manages and represents in the Housing Possession Court Duty Scheme at Oldham County Court. "Thank you very much for helping me out and putting my mind at rest." "Big thanks for all your help and support." "Thank you so much for everything you have done." Shabana is an Immigration and Asylum Solicitor helping clients with asylum applications and appeals and legal aid funded immigration work, which predominantly relates to domestic violence issues. Shabana can assist you in making various applications to the Home Office and can provide assistance at representation in appeals. Shabana qualified as a Solicitor in April 2004 and is also a Law Society accredited Immigration & Asylum Level 2 Senior Caseworker and Supervisor. In addition to English, Shabana is also able to communicate with clients in Punjabi, Urdu, Hindi and Gujarati. 'Thank you for helping me out whenever I needed you'. Kristian specialises in Immigration and Asylum law. He helps clients make their applications to the Home Office for leave to remain in the United Kingdom. Kristian regularly represents clients at oral hearings before both the First Tier Tribunal (Immigration & Asylum Chamber) and the Upper Tribunal (IAC). He has also represented clients on bail matters, cases involving judicial review and appeals to the Court of Appeal. Kristian was admitted as a solicitor on 15 December 2010 and is a Law Society accredited Immigration & Asylum Level 2 Senior Caseworker and Supervisor. "Kristian, Thank you very much for the hard work you did to help me get asylum. I will always remember you"
Camille has experience in Immigration & Asylum, Employment and Housing Law. She has represented clients in the Employment Tribunal, the First Tier Tribunal (Immigration & Asylum Chamber) and the County Court in Housing Matters. She was called to the Bar in 2011 but decided after experience in both Chambers and Law Centres, that a career as a solicitor was her real calling. She is an accredited Immigration & Asylum Level 2 Senior Caseworker, in accordance with The Law Society's requirements. Camille is a member of Young Legal Aid Lawyers and the Employment Lawyers Association. "Thank you for all your help and support over the last year. You have been a great help to me and A and I wouldn't have done it without you." "Thank you for all your invaluable support with my recent disciplinary hearing. The statement proved an extremely useful, even invaluable, tool." "Camille was brilliant, always professional, easy to talk to and always explained everything. Lovely person and I cannot thank her enough. Excellent." Kate is our accountant and works three afternoons each week. She qualified as a Chartered Accountant in 1986, and has worked both in the Profession and in industry. She is our longest standing employee having worked part time at the Law Centre since 2000. Yvonne works on our reception from Wednesdays - Fridays which is open on those days from 9 am - 2pm. Yvonne is the first port of call for all our enquiries here and she has been described as extremely helpful. Yvonne started in 2009 as a dedicated volunteer at the Law Centre. We were able to offer her employment in 2011 and she has been a committed member of staff since, assisting all members of staff and clients with their administrative needs. Yvonne has always had charity in her heart, before coming to the Law Centre she volunteered at an Oxfam bookshop.